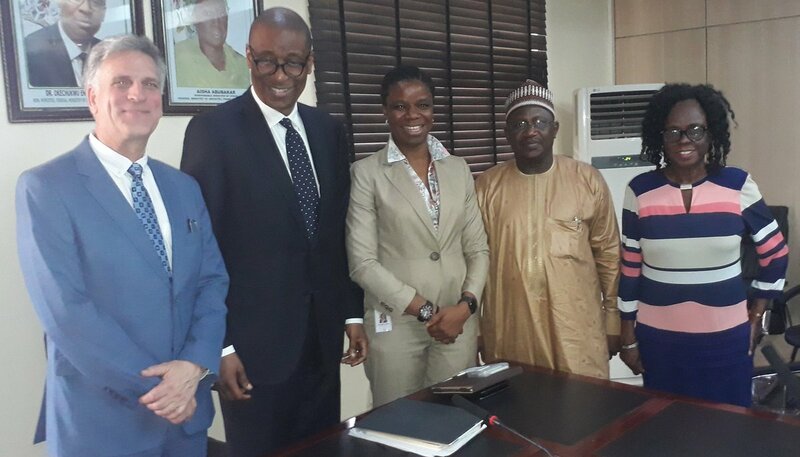 The governments of Nigeria and Canada commenced moves to revive a stalled bilateral agreement between both countries during a courtesy visit of the new Canadian High Commissioner to Nigeria, Philip Baker, to Industry, Trade and Investment Minister, Okechukwu Enelamah, in Abuja last week. Mr Baker, who expressed delight to be in Nigeria after working in Ethiopia, said Canada is ready to collaborate with Nigeria in key areas like mining and aviation in which his country is well developed. He commended the minister on the country’s efforts and achievements on the ease of doing business and on the economy. He said the task before him is to increase trade between the two countries as a means of building future relationships. He, therefore, wanted to know what could be done together. Welcoming the High Commissioner, Mr Enelamah said he believed that his African experience will be useful during his work in Nigeria. He appreciated the relationship between the two countries and said they must make it count. “We will collaborate with you, we will work with you,” the minister assured. Earlier, the High Commissioner had raised the issue of the stalled bilateral treaty and called for a resolution. A Foreign Investment Promotion and Protection Agreement (FIPPA) was signed by Nigeria and Canada in May 2014, which Canada ratified in 2014. But Nigeria decided not to ratify the agreement because it was later found unbalanced and not consistent with Nigeria’s 2016 bilateral investment treaty (BIT) model. Nigeria has therefore requested for the amendment or renegotiation of the agreement. Explaining Nigeria’s position, Yewande Sadiku, Executive Secretary of Nigeria Investment Promotion Council (NIPC) said under a Country-focused investment promotion strategy, NIPC has undertaken diligent process of identifying countries that are strategic to Nigeria’s quest for direct investments. “The deep-dive analysis conducted to determine the priority countries was based on five broad criteria related to Nigeria’s trade relations, global and sectoral investment flows, and Nigeria’s strategic relationships. She said although Canada is among the 20 countries of strategic importance, Nigeria’s new policy considers investors’ rights but ensures that Nigeria is not disadvantaged. Having listened to all the parties involved, including officials of the ministry, Mr Enelamah urged them to take the necessary steps to resolve the issues speedily. He was confident of the ability of Nigeria and Canada to harness their mutual interests and synergies effectively. Investment promotion capabilities of NIPC focuses on proactively targeting and attracting domestic and international investors and investments. It is also actively providing after-care support for businesses in Nigeria.